Again in addition to previous claims that a cabal has taken over the Buhari’s Government has been reconfirmed by Senate President Bukola Saraki after he today claimed the President was not in charge at the Aso Rock. Saraki who is also the Director General of the Atiku Abubakar Campaign Organization, was reacting to the drop in Foreign Direct Investment in Nigeria. 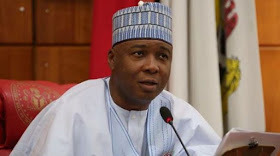 Saraki while speaking to African Independent Television (AIT) said President Buhari had on several occasions, shown he is not in charge of this government. Nnamdi Kanu delivers prove to his claims Atiku is from Cameroon you wont believe your eyes!